Guests will transfer 45mins to the Jorge Newbery Domestic Airport and fly 1 hour north to Santa Fe where they are picked up and driven 3 hours to the lodge. The Resistencia Airport can also be used as an alternative airport. Private ground transfers are available with pick up at the international airport in a 10 passenger. 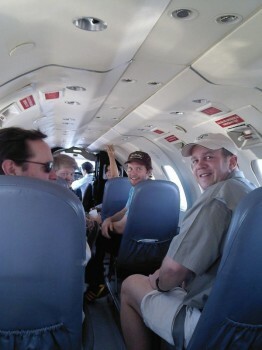 The trip takes 7 hours with a stop for lunch and can put you at the lodge sooner than flying. Many groups choose to drive up and fly back. Private charters can be arranged with departure from the international airport and service to Goya. Our staff will meet guests and drive only one hour to the lodge. With our intimate knowledge of Argentina travel logistics and our specialized travel agent, we take all the guesswork out so you can concentrate on packing. 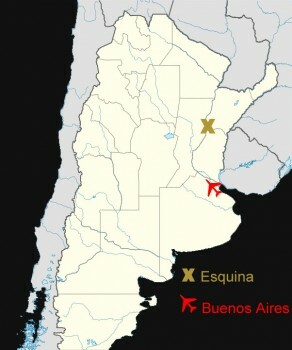 All domestic flights originate from Buenos Aires. Flights into Parana, Corrientes, Resistencia or Santa Fe can be booked online or with your travel agent. Although we monitor your flight times, we ask that you contact us immediately with any flight changes. Allow 4 hours between international arrivals and domestic departures. Confirm and reconfirm ALL flights 7 days and 24 hours before flying. 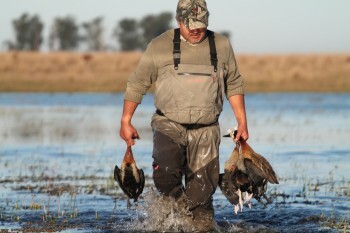 Wing Shooting Argentina is not responsible for costs incurred due to flight delays, changes or cancellations, nor are we responsible for lose of planned activities due to late arrivals. All travelers should be covered with a general travel and health insurance policy. Our guests fly into Ezeiza International Airport (EZE) in Buenos Aires, Argentina via a direct overnight flight. Most domestic flights originate from the Jorge Newberry Domestic Airport (AEP) located 45 minutes from the international airport. Although unnecessary, you may arrange a private transfer with our bilingual representatives between these two airports or to your downtown hotel. 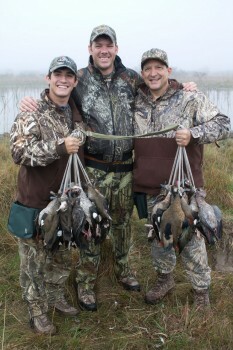 We recommend using our representatives if you have a tight connection, are bringing in guns or if you have never been to Argentina. If you’d like to set up a private airport transfer in Buenos Aires with our representatives, their 2019-2020 rates are about $95 per person each way, with a lesser charge with large groups. The airport transfers can also be made by hiring a remise (private taxi) in both airport lobbies. Although not as personal, getting a remise is cheaper. Allow 4 hours between international arrivals and domestic departures. The prepaid reciprocity fee has been suspended for United States citizens as of April, 2016. U.S. travelers are only required to have a passport which is valid beyond the days they will be traveling. The main reason to purchase travel insurance is for an unexpected event that requires you to cancel your trip and therefore forfeit all deposits. Every year at least one group cancels because of a unexpected family event or illness. Therefore, we highly recommend travel insurance for all our guests. Be aware that although Argentina is a safe country and your hosts take every precaution necessary to ensure your well being, unexpected events may happen. Some people use travel insurance to cover travel upsets such as delayed or canceled flights, lost luggage and medical emergencies. You can be further prepared by buying complete travel insurance that includes medical evacuations. You may shop and purchase a travel insurance plan here. 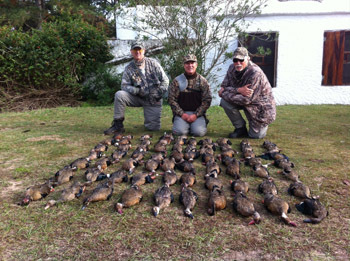 Once in Argentina, many guests extend their high volume dove hunting or duck hunting trip to fish with us in other parts of Argentina. 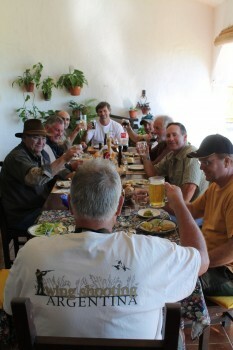 Ask us about our trout fishing trips in Patagonia or even our wine tours in Mendoza. During your visit we may video you, photograph your image and/or quote your comments which could later be used in our promotional material. Please notify us if you do not wish to be videoed, photographed or quoted. No inoculations are required to enter Argentina. First class medical care is available in Buenos Aires. There is a mediocre hospital in the town of Esquina. If you have a health condition, please make sure to bring ALL the medication you need. Using our questionnaire, please notify us of any health conditions or concerns we should be aware. All travelers should purchase a general health and travel insurance policy 15 days after their first deposit. Mosquitoes are can sometimes be an annoyance during the summer evenings and are very rare in the winter. All our lodges serve drinkable well water and bottled water. Travelers who fall ill usually contract something during a flight. You can further protect yourself by washing your hands before meals, not indulging in food and drink for the first 2 days, drink water when not thirsty and get plenty of sleep. When visiting Buenos Aires, use your street smarts as you would in any large city. Both of our lodges have WiFi. Cell phone reception is spotty and if you must communicate via telephone, rent a SatFone. The current is 220v and the sockets are for two round or two diagonal prongs. Bring converters and adapters for your appliances. The food served will be local fair with barbecued meats, chicken dished, homemade pastas, all with fresh fruits and salads. Lunch and dinner will be served with wines from Mendoza. The Argentine money is the peso. Personal purchases can be made with cash pesos, dollars or credit cards. Currency exchange houses and banks will exchange your dollars. Some merchants offer discounts for cash. Personal or travelers checks should not be used. Also ATMs are sometimes out of cash, so we recommend carrying a back up stash of $550. All WSA guides are Argentine, licensed, and insured professionals. Some are bilingual. Slacks and collared shirt are appropriate in Buenos Aires and Mendoza. Feel free to dress as you please at the lodge. 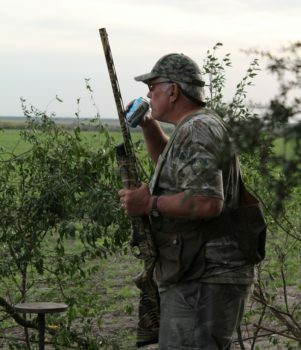 Customary tips in Corrientes are; guides $45 per day with one or two hunters, bird boys $10-$15 per day with one or two hunters and lodge staff $5-10 per room, per day. We believe tips are voluntary and depend on your satisfaction. Time Zone: Argentina Time Standard Time is 3 hours behind Greenwich Mean Time (GMT-3). Their Daylight Savings Time is Dec 30 – Mar 16, during which the time is 2 hours behind GMT.